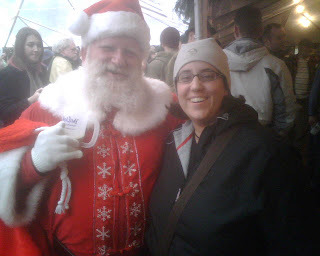 It's hard to believe that it's already time for Portland's Holiday Ale Festival, which runs this Wednesday December 1 through Sunday December 5. This year, there are 47 beers on the "standard release" list -- though they're anything but standard -- bolstered by a few one-offs on the limited release list. There are more interesting and once-only beers than you'd suspect could fit into Pioneer Courthouse Square. If you don't attend the Holiday Ale Festival, then the terrorists win. The price has gone up $5 since last year: you'll pay $25 to get your plastic mug and 10 tickets. Additional tickets are $1, and as always they will not fill mugs from earlier years. If you're really stingy, the festival website has a link to buy a ticket in advance for $20, but since that also includes a $2.60 "convenience fee", it seems a little silly. Or, if you're a real sucker big spender, you can buy a mug, 20 tickets, and a VIP wristband for $49.60. The VIP band doesn't get you any different beers, it just lets you cut to the front of the line, provided you can elbow through the boneheads that get their beer and then just stand around in front of the counter. Bring lots of water. In years past, there hasn't been free tap water, though you can buy bottled water. No minors allowed. Period. Don't even try it. Entrance is on SW 6th Avenue. Go early. The space is pretty small and fills up quickly after work. The festival opens Wednesday at 2 PM, and at 11 AM on the other days. Keep watching for the special tappings. Even the regular beers are special, but some of the special ones are really something. Don't drive. The beers are strong, the parking and traffic are ridiculous. Best bet for bike parking: NE corner of Broadway and Morrison. Warm up your beer. These are some flavorful beers, but because of the weather they can't help but be poured awfully cold. Samples, not full pours. A full pour is between 3 and 3 1/2 times the volume of a sample, but costs 4 times as much. Typical bass-ackwards festival pricing. 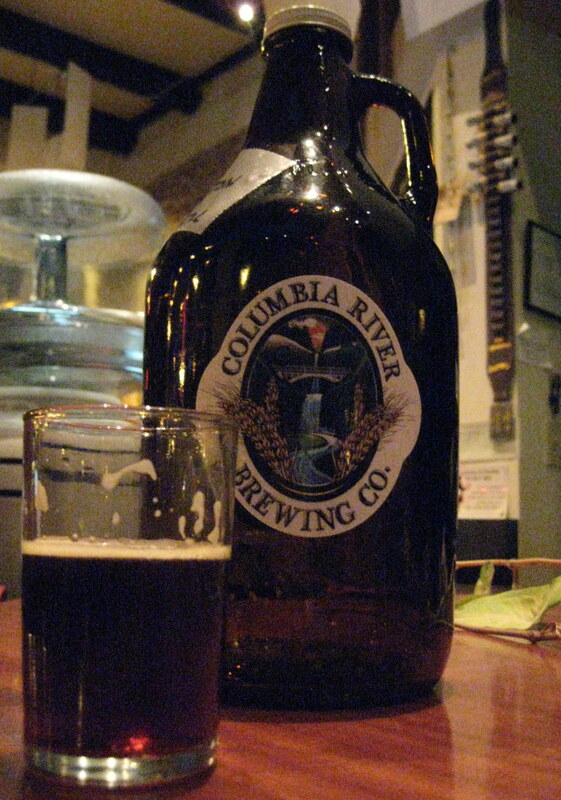 Columbia River Brewing Paddler's Porter: Well-done chocolate-vanilla porter -- no really, it's good -- from the folks who took over the old Laurelwood Pizza location. Lompoc Franc'ly Brewdolph: A twist on Lompoc's usual seasonal -- partly aged in wine barrels. Think aged Jubelale, with a Belgian nose and a hint of red wine. Alameda Papa Noel's Moonlight Reserve: Good NW winter warmer with roasty bitterness. Like a slightly richer Full Sail Wassail. Coalition Lost Glove: Another classic cold-weather beer. Malty, hoppy, straddles the line between old ale and barleywine. Vertigo La Nina: A coffee porter. Big coffee smell; mild coffee liqueur taste. Gilgamesh Cranberry Saison: I was dubious about cranberries in beer, but this was just right. A little fruit, and I think the cranberries were a nice cover for the saison funk. This will be a nice change-of-pace beer. Block 15 Figgy Pudding Olde Stock: Lovely fig/molasses aroma, but I found the flavor too boozy, and surprisingly bitter. Not bad, but couldn't live up to its hype. You're going to try it anyway, maybe you'll like it more than me. Bear Republic Ebeweesner Scrooge: A blend of smoked and sour beers, partially open-fermented, with every kind of alcohol-producing critter thrown in. But for all that effort, not much flavor beyond the raspberry tartness. Seven Brides Weezinator: I thought this was way too bitter for a doppelbock, even though I like doppelbocks and bitter flavors. Natian Old Grogham: A big strong IPA, starts off nice, but has too much lingering aspirin bitterness. Think Lagunitas Undercover Brown + aspirin. I'll put up more beer opinions once I get to the festival. There are a lot of intriguing things on the list. What's on your list to try? who has a list of the Special Limited beers? Is it just me, or do these events seem to be less and less worth it? Doc, they finally posted it and I added a link. I guess I better get over there tomorrow for that 2005 Samichlaus. Grotusque, don't take this the wrong way, but it's just you. The beers and the setup get better every year, but I know how you feel, it's easy to get jaded when there's so much good stuff around every day. The HAF is the only fest I still attend. In regard to 90% of the local fests, I would agree with Grotusque. Same ol stuff, over and over again. Saw the Special Limited list... meh! 1) The VIP ticket gives you a "special" line to use (at all 3 bars; you don't have to fight your way through any line to get to the front. 2) There are rinsing stations. You don't need to bring/but water to clean out your mug, and if you have VIP, yo get free "bottled water" for drinking. 3) It's insane to think you could get a full mug of beers that being "specially" made for the fest for $1 for a full a mug. Of course, that won't get you a full mug of beer. 4) Yeah, the price went up $5 for "at the door" entry. It's not because they are trying to capitalize on everyone, it's simply the fact that in these tougher economic times, every stage of the process has increased costs. the brewers want more per keg, the distributors want more "middle man" fees, the square wants higher rent, and the list goes on. I dare you to name ONE other festival in the area (or anywhere for that matter) that has the same caliber of beers (with so many one-off specialties as the Holiday Ale Festival). I don't need that craptastic, get it anywhere, beer the other local fests bring. I want something special that someone is taking taking the time and putting forth great effort to give to us great beer lovers here in Portland, which the HAF folks so clearly do each and every year. I say bah-humbug to all you haters out there. There's no way you'd get to try this many unique and unusual beers for such a small price. As for the "special tappings" not always happening on time and on schedule, yeah, I too can get a bit annoyed by that, but these are, for the most part, beers that we'd never get a chance to have, and sometimes delivery issues, that not even the festival can control. We know this fest is about spreading the love of beer, and they'd never try to deliberately screw us over. Tired of hearing the crap from the few bad apples that are just cheapa**es or simply don;'t understand basic economics. Well, I thought I said pretty positive things about the fest. I did figure out the mug rinse water this year, but I think they didn't have it in years past. I never expected a full mug for $1. I'm just amused by the small-portion discount situation that prevails at beer festivals, and it's laughable for you to say that the laws of economics dictate that.